I do not remember how I first found Mieko Shiomi's Music for Two Players ii. I used to spend a lot of time Google Image searching "Fluxus" so I probably came across it then and have not forgotten it since. Conversation complicates the speaking act. My brother asks about a friend's new crush and his first question is "How's their chat?" Chat is important to him, because why waste your time on bad chat? he answers when I ask him why he asked them that. I seize up at his answer because, generally, I'm not the best at chatting. I'm a quiet person. I'm not inclined to speak very much and, in certain situations, when too much chat is drawn out of me, I'm easily drained of energy. As I've grown older, my silence prompts more and more commentary, jokes, prods, inquiries, sympathies, concern, and shaming. When I agree to spend time with others what I am mostly agreeing to do is talk. Sometimes, I like to spend time in silence with others. Surpassing the assumed need to fill each moment with words indicates a distinct friendship. Is this assumption my own? If it is or if it isn't, speaking can feel very, very hard. There are tones to balance, topics to be sought, things said that, in retrospect, I'd rather retract or reword, rambling, silly comments, sillier fillers, trailing off, and awkward silences. Sometimes, conversation doesn't flow and I'm left staring at anything other than you, humming, twitching, looking around, checking my phone, hoping you speak again soon. Beginning on March 8, 2018, Refresh Gallery will be hosting rolling performances of Music for Two Players ii as a part of the exhibition Finding Mieko Shiomi. Duos will spend two hours together in the larger, front bedroom of the house. Pre-paired duos and solo performers are both welcome, and any solo performers will be paired with Natalia. Finding Mieko Shiomi has no projected end date or performance schedule. Most of all, this performance may be an exploration of awkward silence, and a desire to tease that moment out into an almost perverse length. To exist there, suspended, between words. What does speaking entail? How do we speak? How do we speak beyond talking? I do not know. But I know we can because we do. What will happen? Will the two performers make noises with their mouths? Will their mouths stay closed? Will they text each other instead of speak out loud? Will they not engage with each other at all? Will they close their eyes? Will they take a nap? Will they put on music? Will they watch a film? Will they write? Will they go through my things? Will they try on my clothes? Will they read my books? Will they open the window? Will they hide? Will two hours seem like a lifetime? Will they cry? Will they sneak? Will they eat? Will they speak? While researching Shiomi, I found a very helpful and comprehensive book by Midori Yoshimoto titled Into Performance: Japanese Women Artists in New York (Rutgers University Press, 2005). Chapter five, titled "Music, Art, Poetry, and Beyond: The Intermedia of Mieko Shiomi", extensively examines Shiomi's life and work and the biography presented below summarizes some of Yoshimoto's research. Mieko Shiomi (birth name Chieko Shiomi) was born in 1938 in Tamashima, Japan and currently lives in Osaka. A classically trained pianist, she entered the Tokyo National University of Fine Arts and Music in 1957 as a musicology major. In her junior year, she became interested in piano improvisations and helped form an improv trio with a vocalist and a flautist. As her studies progressed, she became increasingly interested in avant-garde improvisation as it related to new music and experimental performance, and in her senior year she co-founded a concrète-inspired sound group with four other classmates. A literature student from Chiba University joined them later on and named them Group Ongaku (Group Music). As Yoshimoto writes, "The group's exploration of "previously unthought-of" sounds, created by unconventional methods and with nonmusical objects, preceded that of Fluxus." As Shiomi writes, "Every week we discovered some new technique [or] method for playing a previously unthought-of 'objet sonor' and argued endlessly about how to extend its use, and what relationships of sound structure could be created between each performer. We experimented with the various components of every instrument we could think of, like using the inner action and frame of the piano, or using vocal and breathing sounds, creating sounds from the (usually unplayable) wooden parts of instruments, and every conceivable device of bowing and pizzicato on stringed instruments. At times we even turned our hands to making music with ordinary objects like tables and chairs, ash trays and a bunch of keys." In 1961, Shiomi and some other Group Ongaku members participated in a concert scored by the the avant-garde composer Toschi Ichiyanagi. Yoshimoto's summary is too interesting not to include here: "Provided with an arbitrary set of IBM computer punch cards as scores, seven performers were allowed to interpret them in their own ways: Shiomi first played an electric-wave instrument similar to a theremin and subsequently blew soap bubbles; composer Toshiro Mayuzumi created a huge web of paper tapes over the stage and the audience's seats; composer Toru Takemitsu played the piano; [Yasunao] Tone broke a grinding bowl into pieces with a hammer; [Takehisa] Kosugi used a saw and an electric drill against a wooden board; Ichiyanagi drew lines on a canvas; and pianist Yuji Takahashi had a nonsense conversation with a chair." After graduation, Shiomi began composing with words rather than notes. As she tells Michelle Elligott in an interview for POST, she was "tired of sounds" and wanted to find a way to combine her interest in music, literature, and being in nature. These scores often instruct performers to do activities or actions, and she called these scores her "action poems." 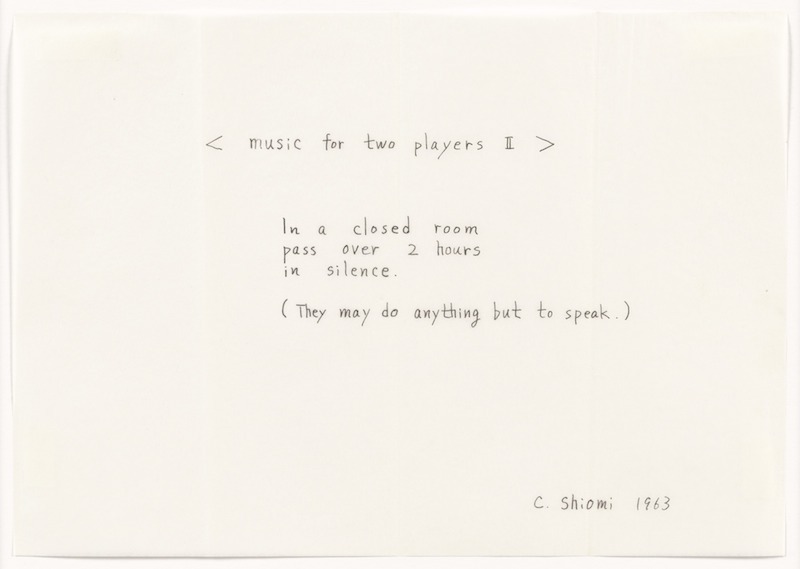 Through her friend Nam June Paik, Shiomi began corresponding with Fluxus-head George Maciunas. In 1964, she moved to New York to join Fluxus and stayed in the city until her tourist visa expired in 1965. Along with artists Yayoi Kusama, Yoko Ono, Takako Saito, and Sigeo Kubota, she was one of the first Japanese female artists to actively work outside of Japan. Yoshimoto succinctly explains that the meaning of many Fluxus events resides precisely in the act of their performance. Towards this, "Shiomi's events are more concerned with the objects and human body in relation to time and space than they are with making sound." In Shiomi's definition, "any "concentrated duration of activity" could be considered music when it involved "the occurrence of sounds and silence," as "feeling duration itself is music." There will be sound, there will be a kind of silence, a duration will be felt. So, we will be making Shiomi's music. When I found out Shiomi was still alive, I thought it may be best to ask if I could host performances of this score at the gallery. I was not able to find contact information for her online, but, I did find a series of interviews between her and MoMA's Chief of Archives Michelle Elligott. I contacted Elligott via Instagram direct message to explain the project and to see if she could get me in touch with Shiomi, but, since we are not Instagram friends, my message came through to her as a request, and it's likely that she never saw it, or ignored it, as I never heard back. Shiomi's Requiem for George Maciunas is available to listen to on YouTube and is one of my favourite pieces of music ever made. Requiem was originally self-released on cassette in 1990, the year I was born. I have a dream of re-releasing Requiem on cassette. I have called this exhibition Finding Mieko Shiomi in hopes that this potential performance of her score will cosmically bring us into contact. To schedule a performance please email refreshgallery1@gmail.com or direct message @refreshgallery on Twitter. Here I will log brief descriptions of each performance, if any performances occur.